Congratulations to Mel who won first prize in my giveaway, and to runners up Donna and Shelly. Thank you to all who entered for your Carnival suggestions, I wish I could have seen them. 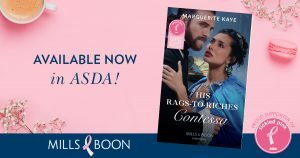 For UK readers, you might know that it is Breast Cancer Awareness month, and Mills & Boon are donating 10% of all pink stickered books sold through Asda to the #TickledPink campaign, including His Rags to Riches Contessa. A number of the Harlequin Historical Books authors are collecting at Asda stores on Saturday 6th October, including me, with help from some friends and family. I will be there from 11-1, 2-4. Lots of other authors in other stores, check out Facebook and Twitter for more details. We will be wearing big blue tshirts, so easy to spot, and we’d all love it if you could come along, make yourself known, buy a book or two and/or make a donation. And maybe do your shopping too! Or if you can’t make it, please do take a pic of yourself at Asda with the books and tweet it, using the #TickledPink tag.